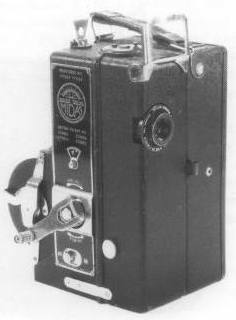 This camera was produced in 1933. It was equipped with a lens Taylor Hobson Anastigmatic, with range from f2,5 to f16. The camera/projector is very heavy (kg. 1,500), and is difficult to handle. Its measures are the following: 140x120x80mm. The mechanism is very complicated: the machine was a movie camera and a projector, at the same time! It is impossible to use the camera by the batteries, because they do not exist now. The original camera was produced in 1933, but in 1938 they produced other three models:the Improved Midas, Super Midas and Midas de Luxe. The last two were equipped with more powerful batteries.